The finned armoured heaters have been developed to satisfy the need of temperature controlled air or gas flows which is present in several industrial processes. They are also suitable to keep a closed ambient at a specified temperature. The are designed to beinserted into ventilation ducts or air conditioning plants and are directly flown by the process air or gas. They can also be installed directly inside the ambient to be heated since they are suitable to heat static air or gases. These heaters are finned to increase the heat exchange. However, if the heated fluid contains particles (which could clog the fins) these heaters cannot be used and smooth armoured heaters shall be used in place. The heaters undergo dimensional and electrical controls all along the production phase, as required by the company quality control system for the industrial standard. These heaters are used in the heating of closed areas, in air conditioning plants, in the forced ventilation used as part of packaging processes and in drying ovens. A proper choice of the construction materials allows to reach fluid operating temperatures up to 120 ~ 200 °C. 1. Terminal Stud threaded M4 (heaters with 11.2mm diameter sheath) or M3.5 (heaters with 8.2 mm diameter sheath) made of stainless steel AISI304. 2. Nuts made of stainless steel AISI304. 3. Washer made of stainless steel AISI304. 4. Insulating Bush made of Ceramic Bead. 5. Silicon Sealing suitable for high temperatures. 6. Sheath made of stainless steel 304 or Incoloy 840, particularly suitable for high temperatures. 7. Electric insulation obtained by a high purity MgO powder, suitable for high temperature, with a grains size distribution optimised for this application. 8. 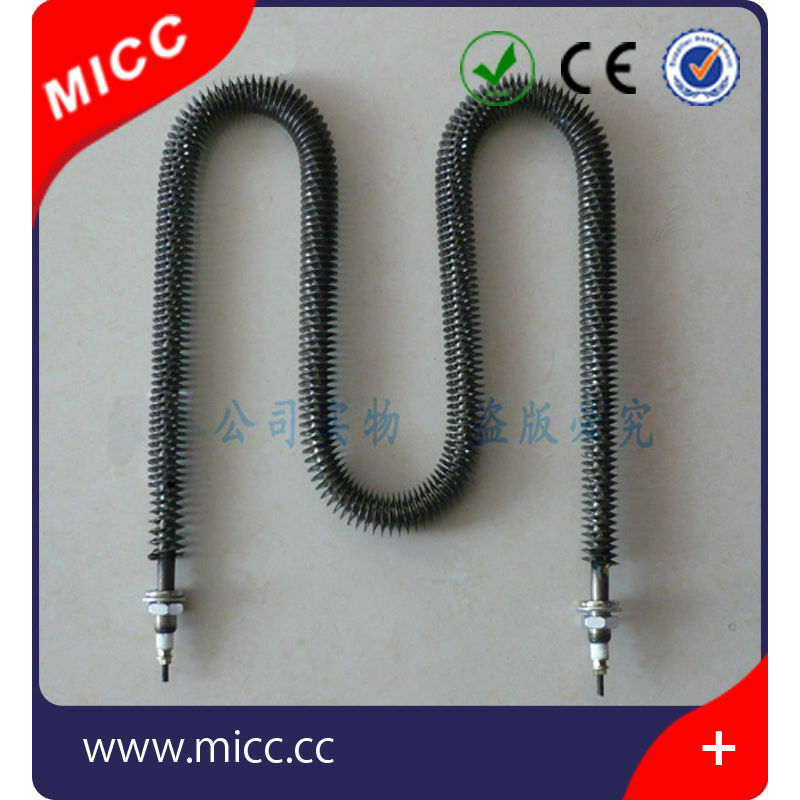 Resistive winding spiral made of nickle/chrome 80/20, executed with automatic tools which insure long duration. 9. External fin obtained by wounding a 0.4mm thick ribbon(pitch=5mm) made of stainless steel ANSI 304 (in case of heaters with AISI 304 or Incoloy 804 sheath). 6 The drawing is preferred. 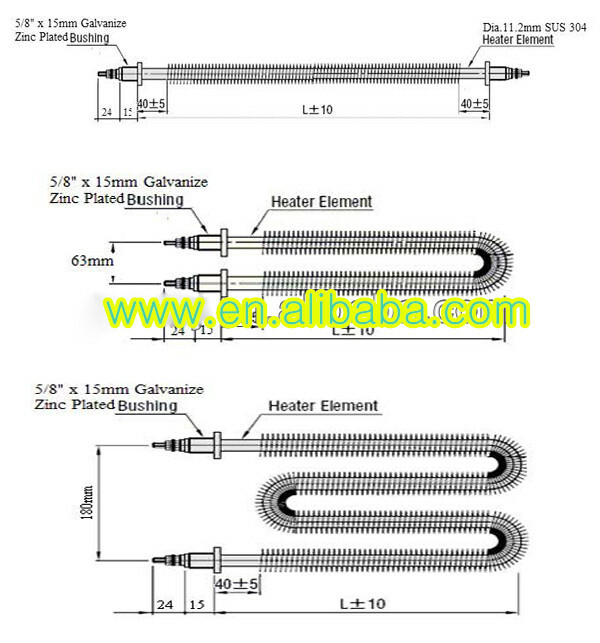 Contact us if you need more details on Fin Tube Air Heater. We are ready to answer your questions on packaging, logistics, certification or any other aspects about Finned Heater、Fin Type Heater. If these products fail to match your need, please contact us and we would like to provide relevant information.